South Africa is a golfers dream. Year round good weather ensures that, for the most part, you will always get your round of golf in. But even South Africa has a winter and golfers in Johannesburg have to brave frosty tee-boxes and sub-zero temperatures, while in the Cape golfers pack their raincoats and brandish their umbrellas to play a round of golf in the Cape wet winter. However, golfers on the east coast of the country, especially in Kwa-Zulu-Natal, simply tee up as if winter does not exist. With average winter temperatures of 23 degrees Celsius it is no surprise that the KZN North Coast, is a popular winter destination for those who are keen to thaw out or stay dry with their golf clubs. The KZN North Coast, or Dolphin Coast, stretches from Durban to the Tugela River mouth and along this route are some of the best golf estates in KZN. They include the stunning Zimbali Golf Estate, Simbithi, Prince’s Grant and a gem of a golf course hidden in the Dlinza Forest in Eshowe. The Eshowe Hills Golf and Eco Estate has grown into being as part of an effort from the local residents to save their golf course. An integral part of the community since 1907 the golf course and country club plays an important part in the residents’ lives. The golf course was upgraded in the 1950’s by Bob Grimsdell and great care has been taken to keep to the original design during the most recent upgrade. 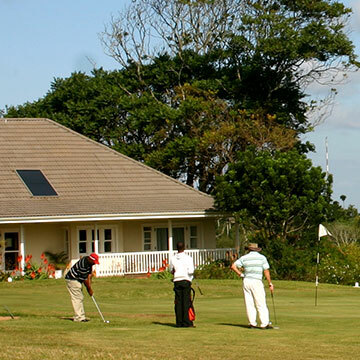 Accommodation is available for visiting golfers in the form of a bed and breakfast venue and self-catering units. From the Eshowe Hills golf estate it is an easy drive up or down the N2 to play on some of the best golf estates in KZN.